EU lawmakers called for a suspension of Turkey’s membership talks with the European Union on Wednesday (5 July), saying President Recep Tayyip Erdoğan’s crackdown on opponents meant Ankara did not meet the bloc’s democratic criteria. A vote on the proposal is expected to pass comfortably on Thursday (6 July), given support from the biggest parties, but the parliament has limited influence on the issue. The European Commission and EU governments have so far ignored calls for a formal suspension of a process already effectively in limbo. “We are not calling to stop all dialogue or cooperation, talking about integration is just not realistic at this moment,” Kati Piri, the lawmaker who drafted the recommendation that will be put to the vote, told reporters before the debate. EU leaders have been critical of Erdoğan and his behaviour toward opponents, both before and after an abortive coup against him a year ago. But they do not want to undermine an agreement struck last year whereby Turkey effectively stopped migrants reaching Greece, easing a crisis that had threatened EU unity. Johannes Hahn, the European commissioner responsible for membership talks, told lawmakers there could be no advance in those negotiations unless Turkey met EU demands to respect political freedoms. However, he said the EU would remain “engaged” and made no mention of halting the accession process. We cannot and will not ignore the worrying developments in #Turkey – precisely because we want fruitful bilateral relations. In reality, there has been little progress on Turkey’s membership bid since negotiations were formally launched 12 years ago. Many EU leaders question whether Turkey, a large, relatively poor and overwhelmingly Muslim country, should ever be let in and many Turks have also cooled to the idea. To the people in #Turkey, we would like to say: your struggle doesn't go unnoticed. We'll continue standing with you! @KatiPiri #EPlenary ?? Turkey's EU Affairs Minister Omer Celik said on Thursday ahead of a European Parliament vote on suspending Turkey's membership bid, "We reject with the back of our hand any proposals that there should be strong cooperation between Turkey and the EU in other areas instead of accession talks"
Turkey's Deputy Prime Minister Numan Kurtulmus told Reuters, "Europe displaying inappropriate behaviour towards Turkey is not a situation we can accept. Being against our President Erdogan is also not a rational stance from Europe. 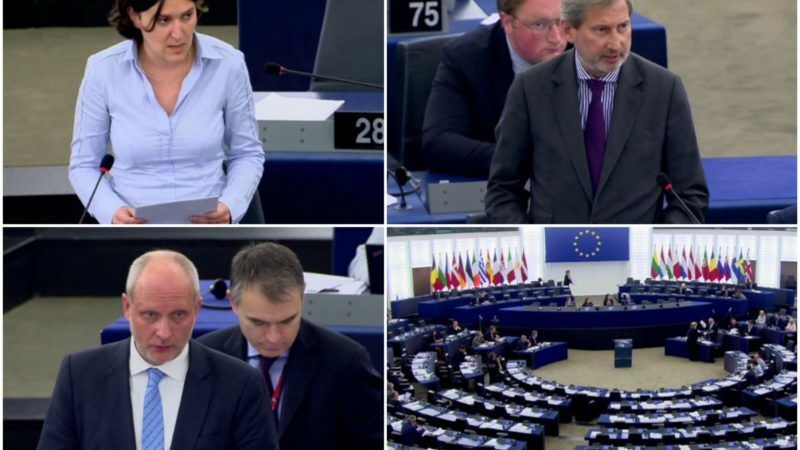 Europe must decide: ... do they really want to enlarge?" The EU has lots of issues . Wrong Body structure No federal administrations no constitution No senate but some policitians wants Still Turkey for EU accession . Have they been paid to turn Europe in a disaster with Turkey ? It’s already wron to even think about it . Yes – the Half-empty room is right .